Advantages: Superb registration, thin carrier film, 13 interesting subjects, comprehensive full colour views of each option. Conclusion: If you are looking for alternative markings for your 1/32 scale Tamiya Mk IX then I’m sure that you will find something that takes your fancy here. The name Hussar Productions is probably better known for producing resin accessories for armour modellers than it is for producing decals but this new sheet created by them will establish their name for producing high quality decal sheets as well. 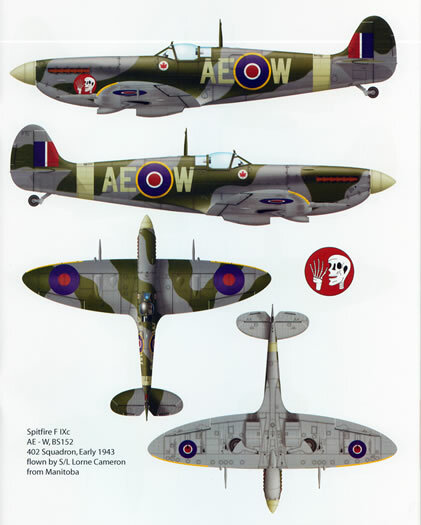 Given that Hussar Productions are based in Canada it is understandable that the subject of this new sheet is Canadian Spitfire Mk IXs. 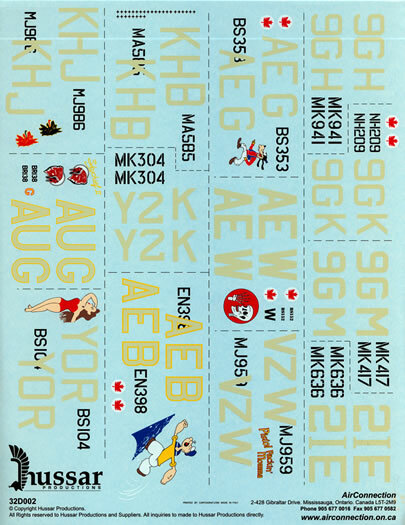 The sheet provides markings for 13 different machines flown by Canadian pilots. MK941, a LF Mk IXC, coded 9G-H of 441 Squadron, September/October of 1944. Flown by Flight Lieutenant Hugh Richie. 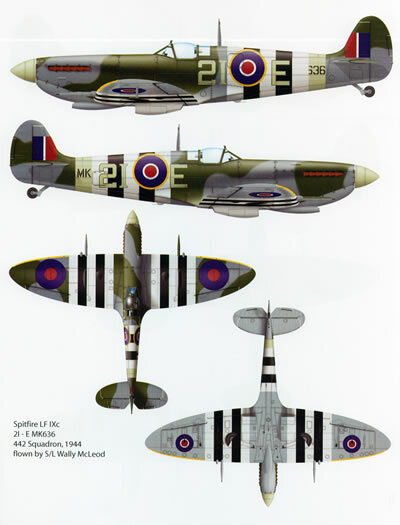 The machine is finished in the Royal Air Force’s day fighter scheme comprising ocean grey and dark green upper surfaces over medium sea grey undersides with a sky spinner and fuselage band as well as yellow leading edges to the outer ends of the wings (as are all of the options on the sheet). It also has the remnants of the black and white D-Day identification markings on the undersides of the wings and the fuselage. BS398, a LF Mk IXC, coded AE-B of 402 Squadron, February/March of 1943. Flown by Flying Officer Ian Keltie. It wears the red maple leaf on a white circle background insignia that was worn by pretty well all of the aircraft of the Kenley (Canadian) Wing. It also wears nose art in the form of the cartoon character “Popeye the Sailor” on the left hand side of its nose. 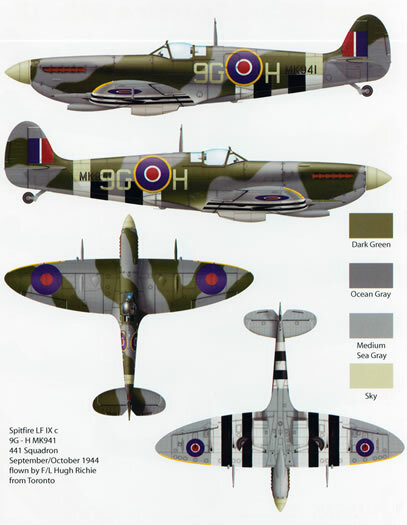 Another unusual feature of the markings is the fact that the sky coloured squadron codes are thinly outlined in yellow. BS353, a LF Mk IXC, coded AE-G of 402 Squadron, 1943. Flown by Flying Officer Norm Keene. It too wears the maple leaf insignia as well as nose art in the form of the cartoon character “Goofy” on the left hand side of the nose. BR138, a Mk V airframe that was upgrade to Mk IXC standards. Coded AU-G and belonging to 421 Squadron, June 1943. It was flown by Flying Officer J.A. “Red” Omand and Flying Officer Richard “Hap” Beall. It wears the name “”Skychief II” in yellow lettering on the port side of the nose as well as nose art in the form of war bonnet wearing Indian on both sides of the nose (this marking was a decal from the Canadian Mcoll Frontenac Oil Company). It also wears thin yellow outlines to its squadron code letters. MJ986, a LF Mk IXC. Coded KH-J and belonging to 403 Squadron, March 1944. Flown by Sergeant (later Pilot Officer) Norman Chevers. It wears nose art on the port side of the nose in the form of what appears to be a heraldic style wolf. This marking is supplied in both red and black. An oddity with the machine is that the antenna mast is painted yellow. MK363, a LF Mk IXC. Coded 21-E and belonging to 442 Squadron in1944. It was flown by Squadron Leader Wally McLeod. Two different illustrations of this machine are provided, one showing it wearing full “D-Day” recognition markings and the other without these markings. “D-Day” recognition markings and the other showing it sans the markings on the upper surfaces of the wings and the fuselage. NH209, a LF Mk IXC coded 9G-K of 441 Squadron in October of 1944. Flown by Flight Lieutenant Guy Mott. It wears the remnants of its “D-Day” recognition markings on the underside of its fuselage as well as the maple leaf marking on both sides of the fuselage under the windscreen. BS152, a LF Mk IXC coded AE-W of 402 Squadron in early 1943. It was flown by Squadron Leader Lorne Cameron. It wears the maple leaf insignia on both sides of the fuselage under the windscreen as well as nose art in the form of the skull and a skeletal hand on a red disc background on the left hand side of the nose. MA585, a LF Mk IXC coded KH-B of 403 Squadron from October of 1943. Flown by George “Screwball” Beurling. It wears the pilot’s considerable “scoreboard” comprising 29 German Balkenkruz on the left hand side of the nose. It is illustrated showing it carrying an auxiliary fuel tank. MJ959, a LF Mk IXC coded VZ-W of 412 Squadron from 1944. Flown by Flight Lieutenant Edward “Lucky” Likeness, it carries the name “Pistol Packin’ Momma” in yellow lettering ‘shadowed’ in red on the left hand side of the nose. BS104, a LF Mk IXC coded YO-R of 401 Squadron and flown by Flying Officer T.K. Ibbotson. It carried nose art on the left hand side of the nose in the form of a bathing suit clad woman. The decals come on a large sheet that measure 8½" x 11". The decals for each option are restricted to the aircraft serial number as well as its squadron codes and any other distinctive marking peculiar to the machine. Neither national insignia nor stencil data are supplied. The decals have been printed by Cartograf. They are glossy, thin and have a minimum of film surrounding each subject. Everything on my sample is in perfect register and the sky colour of the squadron code letters has been faithfully reproduced. The placement guide comes in the form of an A-4 sized book comprising 16 good quality glossy pages (including the covers). Each option receives a page of its own that shows both left and right fuselage profiles as well as upper and lower surface plans views. 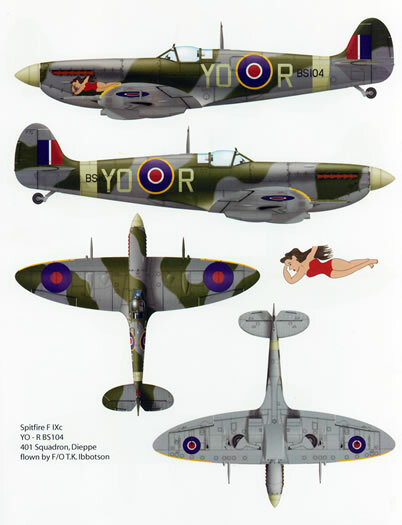 Any distinctive nose art or marking that the option wore is also reproduced as a scrap view. All illustrations are in full colour. Supporting text for each option is minimal and there are a few spelling glitches as well as a missing description but overall, it is a well produced product. Packaging is via the industry standard clear plastic zip-loc bag with the decal sheet it self being protected by a thin film of grease-proof paper. If you are looking for alternative markings for your 1/32 scale Tamiya Mk IX then I’m sure that you will find something that takes your fancy here. 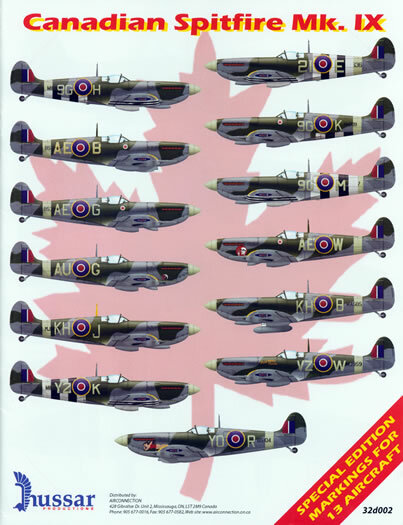 If you are looking for some further reference for Spitfires flown by Canadians, seek out SPITFIRE THE CANADIANS by Robert Bracken ISBN 1-55046-148-6. 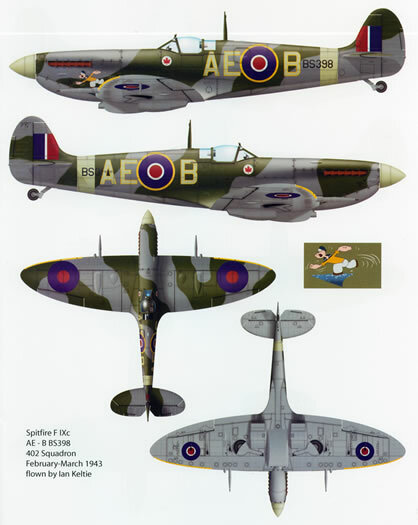 Apart from giving you an understanding of what it was like to fly and fight in the Spitfire its pages are also crammed with good quality close-up images of some of the options on this sheet as well as further colour profiles.